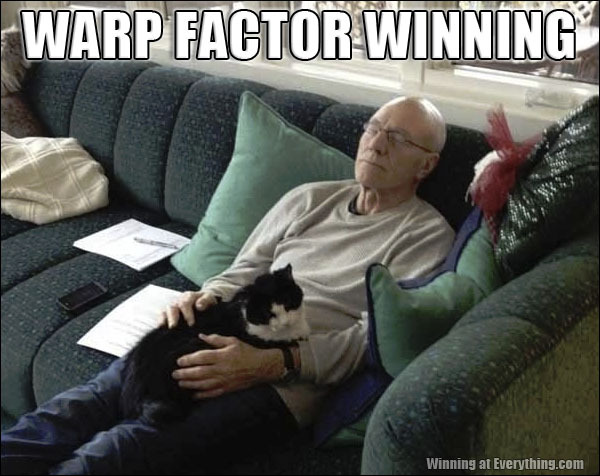 Patrick Stewart can even make cats look cool. Shame about that couch, though. As Steward relaxed and emitted a bassoon note of relief from his lower quadrant, Fluffy realized too late that she’d been dutch ovened again. Five days would pass before they discovered Patrick Stewart’s skeletonized remains and a very overweight feline. I am insanely jealous of that cat right now. Wake up and pet me, Patrick! Pet meeee! Patrick strained against the clawing of the gerbils in his colon.